The best NRL Preview on the net kicks into gear for the Finals with all the info you need to make an 'informed tipping decision' or feel better about your team's chances in September. Make sure you bookmark www.wdnicolson.com and compare your picks to the Podcast Panel's Tips all month long and make sure you grab the Podcast every Thursday. Check back on Friday for the Latest Mail as it breaks. New Feature For the Finals - What's the Game Plan? The Results Blog is here. Pick your team from the positional tables and watch them score Tries for you throughout the Finals Series. 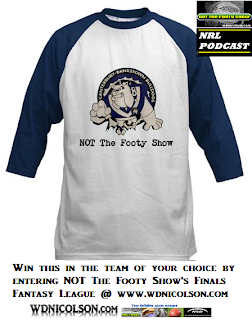 There are triple points on offer for Grand Final Points and the winner walks away with a specially created NOT The Footy Show 'Old School Team Logo' T-Shirt. Cut-off is 7:30pm before the 1st Qualifying Final on September 9. 07/09 Odds are courtesy of Sportingbet Australia - Line Varies. 7:45pm (Local) 9 September @ ANZ Stadium, Sydney. What are the potential Game Plans for the Tigers and Dragons? 4th TIGERS TEAM RECORD 15-9 for 34 Points, +89. 5th DRAGONS TEAM RECORD 14-9-1 for 33 Points, +142. TIGERS 5 DRAGONS 5 - The Tigers stunned the Dragons late in Round 22 - winning 16-14 at the SFS in a semi-final like atmosphere. But the Dragons had won four in a row before that. Last Finals Match: St.George-Illawarra moved into the 2010 Grand Final at the Tigers' expense 13-12 at ANZ in the Preliminary Final. WTG: Moltzen, Ryan, Ayshford, Lawrence, Tuqiri, Marshall, Lui, Gibbs, Farah (c), Galloway, Fulton, Ellis, Heighington. Bench: Brown, Flanagan, Groat, Woods, Utai, McKinnon, Fifita. STI: Boyd, Morris, Gasnier, Cooper, Nightingale, Soward, Hornby (c), Hunt, Young, Weyman, Scott, Creagh, Prior. Bench: Green, Fien, Cuthbertson, Merrin, Rein. To find out the Panel's tips and why they are tipping them - listen to the Podcast or watch the Tipping Video. Out Thursday. SMH and Other Late Mail 08/09 - The Tigers will not risk Chris Lawrence, with Matt Utai or Mitch Brown coming into the centres to replace him. The Dragons will choose between Adam Cuthbertson and Mitch Rein for their final bench spot. TIGERS To Win By 4 Points. 6:30pm (Local) 10 September @ Suncorp Stadium, Brisbane. What are the potential Game Plans for the Broncos and Warriors? 3rd BRONCOS TEAM RECORD 18-6 for 40 Points, +139. 6th WARRIORS TEAM RECORD 14-10 for 32 Points, +111. BRONCOS 5 WARRIORS 5 - Brisbane won a thriller 21-20 at Suncorp in Round 22 but the Warriors had won both games in 2010. Last Finals Match: Have never played a NRL First Grade Semi Final but met in the Semi Finals of the 1997 World Club Challenge with Brisbane winning 22-16 in Brisbane. BRI: Beale, Copley Reed, Hodges, Yow Yeh, Lockyer (c), Wallace, McGuire, McCullough, Hannant, Glenn, Te'o, Parker. Bench: Gillett, Hunt, Anderson, Hala. WAR: Locke, Tupou, Moon, Berrigan, Vatuvei, Maloney, Johnson, Sam Rapira, Heremaia, Lillyman, Mateo, Mannering (c), Luck. Bench: Brown, Hohaia, Matulino, Packer, Ta'ai. SMH and Other Late Mail 08/09 - The Warriors have lost Shaun Berrigan to a hip injury and Lewis Brown will play in the centres. WARRIORS To Win By 1 Point. 8:30pm (Local) 10 September @ Sydney Football Stadium, Sydney. What are the potential Game Plans for the Sea Eagles and Cowboys? 2nd SEA EAGLES TEAM RECORD 18-6 for 40 Points, +208. 7th COWBOYS TEAM RECORD 14-10 for 32 Points, +52. SEA EAGLES 5 COWBOYS 5 - Manly won 24-4 at Brookvale in Round 14, but the Cowboys won 22-20 in Round 8 in Townsville. The teams have split the last 4 games. Last Finals Match: Manly moved into the 2007 Grand Final after defeating the Cowboys 28-6 at the SFS in the Preliminary Final. MAN: B Stewart, Robertson, Lyon (c), Matai, Hopoate, Foran, Cherry-Evans, Galuvao, Ballin, Kite, Watmough, Mauro, Rodney. Bench: Robinson, Buhrer, Rose, T Williams, Seuseu. NQL: Bowen, Graham, Tate, Tonga, Fai-Fai Loa, Thompson, Thurston (c), Scott (c), Payne, Tamou, Cooper, Hall, Johnson. Bench: Segeyaro, Bolton, Taumalolo, A Sims, C Paterson. SMH and Other Late Mail 08/09 - There remains some doubt over Will Hopoate (Knee) and Brett Stewart (Knee) but they will be given until Saturday to be right. COWBOYS To Win By 4 Points. 4:05pm (Local) 11 September @ AAMI Park, Melbourne. What are the potential Game Plans for the Storm and Knights? 1st STORM TEAM RECORD 19-5 for 42 Points, +213. 8th KNIGHTS TEAM RECORD 12-12 for 28 Points, +35. STORM 8 KNIGHTS 2 - Melbourne are well on top in this rivalry - winning 42-12 at AAMI in Round 8 and winning 4 of the last 5 back to 2009. Last Finals Match: Newcastle beat Melbourne 30-16 in their 2000 Qualifying Final and eliminated the Storm - the defending premiers. MEL: Slater, Duffie, Nielsen, Champion, Quinn, M Blair, Cronk, Bromwich, Smith (c), Norrie, Proctor, Manu, Lowrie. Bench: Hinchcliffe, Kostjasyn, Woolnough, Lowe, Thompson, Waqa. NEW: Gidley (c), McManus, Sa'u, MacDougall, Uate, Stig, Mullen, Tuimavave, De Gois, Kaufusi, Houston, Costigan, Edwards. Bench: Southern, Tetevano, Fa'aoso, Taufua. SMH and Other Late Mail 08/09 - The Storm may not have Maurice Blair (hammy) and if he is out, Rory Kostjasyn would move into the halves from the bench. The Knights should have Junior Sa'u after he passed a fitness test on Thursday. STORM To Win By 10 Points. Right Click Save Target As This Link if you don't have iTunes. Benji Marshall wins the 2011 NRL Tweet Player of the Year Award. 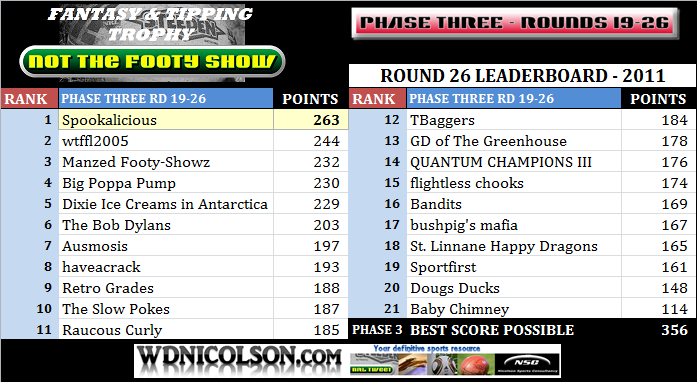 Join Nic, Russ and Waz to find out who he beat for the top prize and will the Dally M's copy our results 24 hours later (they didn't with Billy Slater taking out the prize)? Plus we hand out the Rookie of the Year, Representative Player of the Year, Team of the Year, Mr Consistency and NRL Game Breaker Awards. Plus a quick Qualifying Finals Preview. 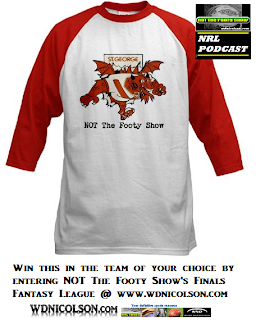 We will review Round 26 of the 2011 NRL Premiership on Thursday and give you our expanded thoughts on the first week of the Finals in Episode 82 with guests Andy Raymond, Matt Duncan, DC Chapman and Maria Tsialis. Congratulations to Luke Wheeler's entry 'Spookalicious' - you have won a NTFS T-Shirt in the team of your choice. The NRL Tweet finished with 125 correct tips from 192 Games in 2010 at a strike rate of 65%. All Tipsters need to tip with the start/line in mind. So if a team is +7.5 then if they pick the other team, that side must win by 8 points or more to get the tip correct (if it is +2.0 then the other side must win by 3 points). Starts for each game are based on Thursday's Line - as listed in the matchups at the top of the preview. 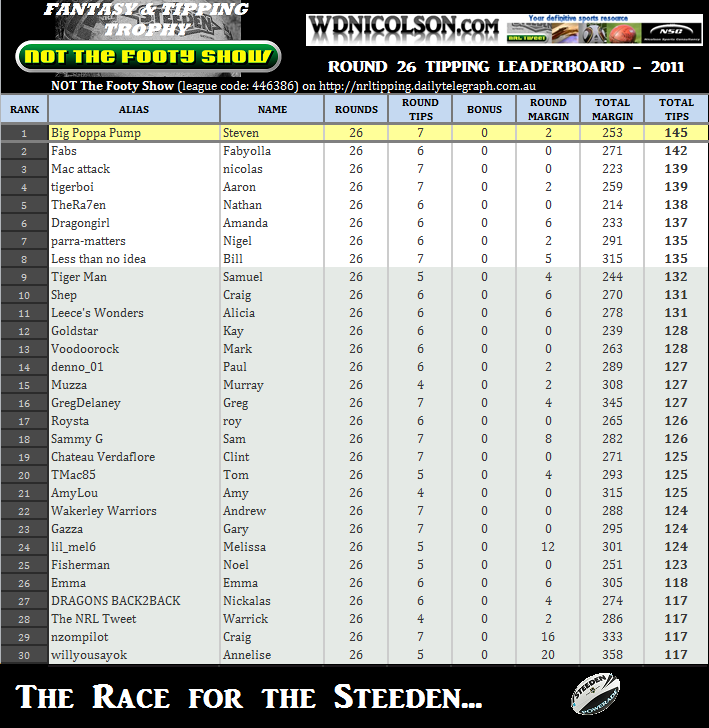 ]-[ The winner of NOT The Footy Show's Tipping Competition is Steven Benham and he has won an Official Steeden Match ball. TIPS DONE, GO OUT AND ENJOY THE SEMI FINAL FOOTY! Subscribe here for a new Podcast every Thursday.